We had an excellent trip up the Indian River, here at Prince Rupert Bay on Dominica. The trip, organised by Martin Carrierre (OCC Port Officer Representative) aided and abetted by Albert, took around 20 OCC members and crews up the tropical river as part of the rally that Martin has organised here this week. Unfortunately Jane and I are leaving on ZWAILER tomorrow but thank Martin for his help, last night's BBQ (and rum punch!) and are sure that the rest of the rally will go just as well. 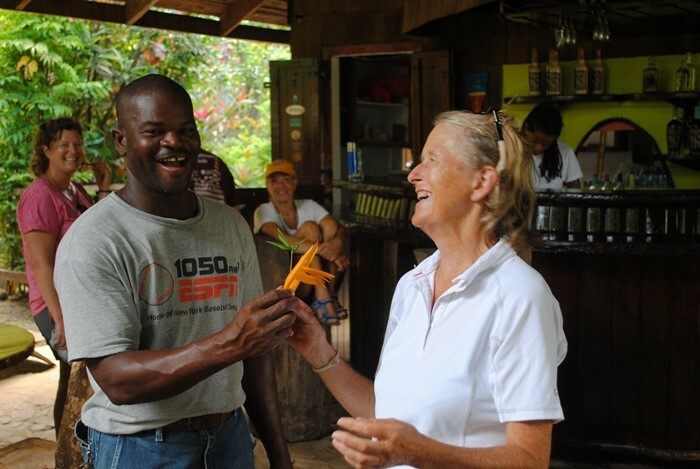 We recommend this part of Dominica and Martin's services in particular to any passing sailors . He can be contacted on VHF 16 on his boat PROVIDENCE. Photo (c) Richard Kingsnorth. Martin Carriere with Jane Kingsnorth. More photos can be found in the OCC photos gallery. Follow the link below.